Never before on audio! A #1 national bestseller about a man who wakes up from a five-year coma able to see people’s futures and the terrible fate awaiting mankind in The Dead Zone—a “compulsive page-turner” (The Atlanta Journal-Constitution). Johnny Smith awakens from a five-year coma after his car accident and discovers that he can see people’s futures and pasts when he touches them. Many consider his talent a gift; Johnny feels cursed. His fiancé married another man during his coma and people clamor for him to solve their problems. When Johnny has a disturbing vision after he shakes the hand of an ambitious and amoral politician, he must decide if he should take drastic action to change the future. 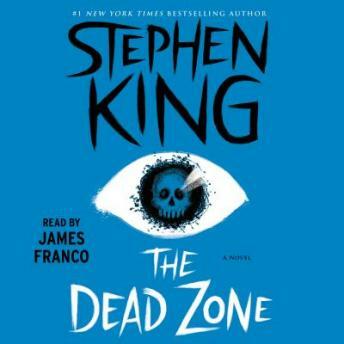 The Dead Zone is a “faultlessly paced…continuously engrossing” (Los Angeles Times) novel of second sight. The story is good, but.. James Franco, the worst reader in human history. He mumbles, he lisps. He's polish doctor (who came to america as a kid and don't speak polish) speaks with same accent as Franco's Tommy Wiseau in Disaster artist. That is when Franco can keep the accent. Definitely one of the most underrated King novels in my opinion. Really enjoyed the story and felt more and more connected with John (main character) as it went along. Franco does a wonderful job with the narration. Side note: Christopher Walker plays John Smith in the film adaptation. As most King TV/film adaptations it’s pretty cheesy, but who doesn’t love a young psychic Walken. Worth a listen, then a watch. Classic Stephen King. I read this book many years ago, but didn't remember much of the detail. It was great to listen to it after all these years. It keeps up a good pace and avoids unrelated side stories. Book is great and I am a big James Franco fan as a narrator overall, but I do have one small issue. I will warn any future listeners that the voice Franco uses for one of the characters is the same accent he ended up using in his recent film "The Disaster Artist." It isn't a dealbreaker, but now I can only see the character as Tommy Wiseau and giggle every time he starts talking. Love this book and with James Franco narrating, I didn’t want to stop listening!! This is the first listen and probably my fifth read of this great book. Excellent book and Excellent narrator. James Franco was great as expected!